Our RYA Yachtmaster Ocean shorebased course is run over 5 full days, usually 5 consecutive Saturdays or Sundays, as this is a course which benefits from being run in this manner. Alternatively we will run an RYA Yachtmaster Ocean course in one week over six consecutive days for a school, club or organisation for 6 or more candidates; this is ideal for those who need the course completion certificate to comply with the RYA and MCA requirements. We run our Day Skipper and Coastal Skipper/Yachtmaster Offshore courses in the Royal St. George Yacht Club, in Dun Laoghaire and in Howth Yacht Club in Howth on one night a week during the winter months starting in October and finishing around the end of February or beginning of March. These shorebased courses are often called navigation courses but they should more correctly be thought of as navigation and seamanship courses. They deal not only with navigation but with many of the other important aspects which combine to make cruising safe and enjoyable. The shorebased courses are intended for both sail and power. has presented Irish Yachting Association, Irish Sailing Association and Royal Yachting Association shorebased cruising courses since 1991. Since 2016 ISA recognised schools must use only Royal Yachting Association (RYA) shorebased course packs. Irish cruising sailors and motor boaters will be well aware of the RYA and the RYA’s reputation; RYA qualifications are highly respected in many countries. ISA Yachtmaster Ocean = RYA Yachtmaster Ocean. Each course includes a number of exercises which you complete at home in your own time; they play a key part in the learning process as through them you, and your instructor, become aware of any misunderstandings you may have of the subject. These exercises are intended to help you understand the subjects covered throughout your chosen course. 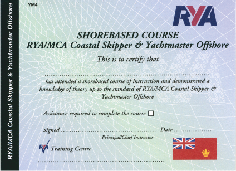 The RYA course material is comprehensive and includes practice charts, course notes and Training Almanac for the RYA Day Skipper and Coastal Skipper/Yachtmaster Offshore courses. There is no change in our commitment to presenting our courses in the same friendly yet professional manner which has made Sea~Craft recognised for 26 years as the premier navigation course provider for leisure sailors in Ireland. Cruising is really all about arriving in new harbours, marinas and anchorages. David, who presents the courses, has a vast and unequalled knowledge and experience built up over 46 years of cruising in many different types of boats under sail and power both locally and worldwide. Sea~Craft’s shorebased courses are an enjoyable way of passing one night a week during the winter months building your knowledge and making new friends who share a common interest.